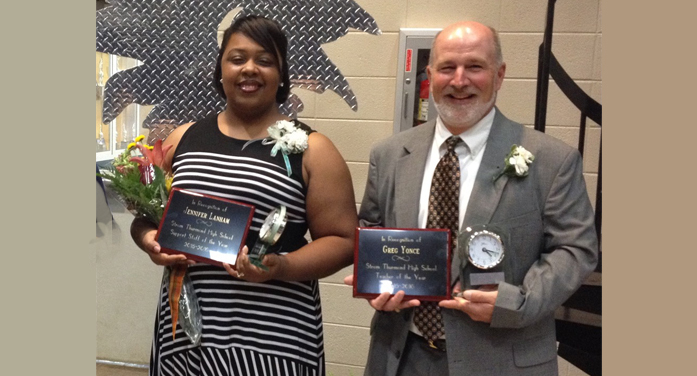 Strom Thurmond High School winners, SSOY 2016, Jennifer Lanham; TOY 2016, Gregg Yonce. The program was a little different this year for the TOY, COY and SSOY presentations. This is the program that introduces the Teacher of the Year and the Support Staff of the Year from the District schools and the Citizen of the Year, sponsored by the Chamber of Commerce – a joint effort by the Chamber and the School District. It is always an event full of anticipation, and was no different in that way this year, though, instead of a seated dinner, guests were treated to a dessert reception followed by a program of presentations. Early in the afternoon, the STHS cafetorium and central hallway held a large crowd in support of the candidates. Among the guests were School Board members, teachers, government representatives and friends and supporters of the nominees. Following the reception the nine staffers and eight designated Teachers of the Year – all coming from the representatives’ schools — were introduced first and were given engraved awards announcing their nomination. Special comments including the following explained why these folks were chosen: “calm sunshine,” “goes beyond her duties,” “she has a servant’s heart,” “he daily shows dedication.” (More on the school nominees, page four in the print edition) ) The chosen Support Staff of the Year for 2016 is Jennifer Lanham of Strom Thurmond High School. 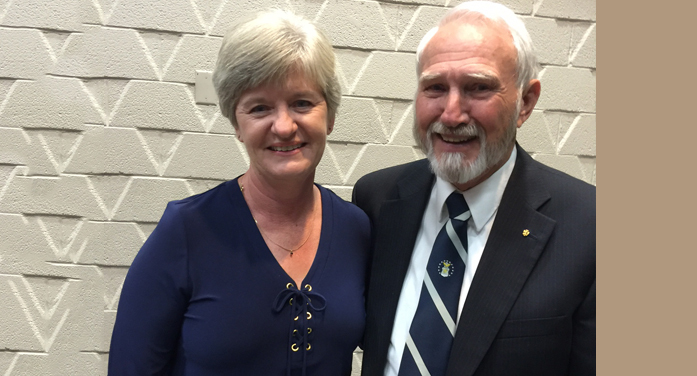 2015 COY Sam Watson congratulates the new Citizen of the Year Deborah Henderson. TOY nominees inspired these remarks: “He keeps the students laughing and at ease,” “strong beginner teacher,” “mentor,” “patient and caring,” “She loves her job,” “always looking for new strategies.” The Teacher of the Year for 2016, representing the Edgefield County School District, is Gregg Yonce, a 26-year teacher veteran of Strom Thurmond High School. It was a total surprise, as seen in her demeanor, for Deborah Henderson when she saw her three sons enter by a side door and stand against the wall, one with his family, and when she heard the 2015 COY Sam Watson say: “She is head of the Johnston Food Bank.” Of course there were other credits given to this very active community volunteer, including her work for her church, Harmony Methodist. James Courtney was given accolades as was Melissa Jackson of the Foods Service. Both were active in the planning and executing of the event. Chamber Director Donna Livingston was active in the program planning also and emceed the COY announcement. Special praise was given to the new Superintendent of Education Maddox. Retiring Board Chairman Brad Covar noted that Maddox was the right choice, for “the new Superintendent had to have less hair than the Board Chairman (Covar).” Humor, laced with earned praise, gave the afternoon a special lift in anticipation of a good year with the newly named leadership of COY, TOY and SSOY.